We are gearing up for SAS Global Forum! Are you? What is SAS® Global Forum, you ask? It is the premier event for SAS professionals worldwide, offering educational and networking opportunities, as the conference has done since the first meeting in 1976. The conference is an annual event planned and sponsored by the SAS Global Users Group, which is open to all SAS software users throughout the world. This year’s conference will be held in San Francisco’s Moscone Center West from April 28 – May 1, and JMP will be shown in many ways. You can find JMP incorporated into some of the sessions listed below. And some of these presentations will be by our very own JMP development staff. See JMP in action at the SAS Support and Demo Area, located on Level 1 of Moscone West. This space is 64,256 square feet of SAS user delight. From Sunday evening until 5 p.m. on Wednesday when the demo floor closes, you can stop by the JMP booth and visit with JMP developers, ask those burning questions you may have, and talk with other JMP and SAS users about how you are using the software -- and if you’re lucky, you might even be able to find out a little bit about new features that will be available in JMP 11, which is coming out later this year. 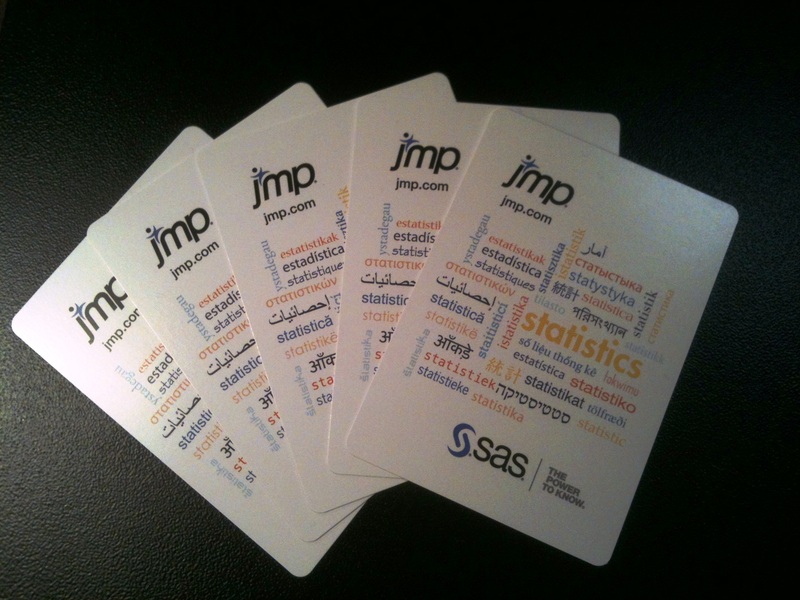 We will have cool giveaways, including JMP stickers and window clings (so you can spot your fellow JMP users), and you can join us in support of the International Year of Statistics by sporting an I ♥ Statistics, Statistics 2013, or 2013* pin. We will also be dealing out a new design of playing cards to show our love of statistics in every language. If you aren’t able to make it to San Francisco at all this year, you can still be a part of the action via SAS Global Forum Livestream! You can watch the opening session, the presentation by SAS Co-Founder and JMP chief architect John Sall -- From Big Data to Big Statistics on Tuesday morning from 9:30 a.m.-10:30 a.m. PST -- and Wednesday morning’s Live Report, all via the Livestream! That’s just a sampling of what you can expect from JMP at this year’s SAS Global Forum. If you’d like to learn more, visit the SAS Global Forum website. We hope to see you in San Francisco!